Sandwiched between San Diego and Los Angeles, the “OC” is the perfect-fit vacation destination for almost anyone – rambunctious families, canoodling couples or groups of friends looking for a surf-style good time. By the beach, you can scoot along the oceanfront Pacific Coast Highway (Highway 1) or detour inland to Disneyland. On this sun-kissed coast, every beach town has its own flavor. Huntington Beach, aka “Surf City, USA,” is all about the waves, dude. Next up is Newport Beach, with its tony yacht harbor and soap opera-worthy white sands. Farther south, past wild and undeveloped Crystal Cove State Park, Laguna Beach is an early 20th-century artists’ colony bordered by sea coves ideal for kayaking, snorkeling and scuba diving. 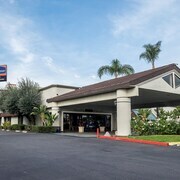 Business travelers often find it more convenient to base themselves at hotels further inland, near John Wayne Airport (SNA), a regional air hub. 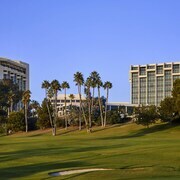 The airport is located near the intersection of several major freeways, and less than an hour’s drive from LA or 90 minutes from San Diego without any traffic jams.